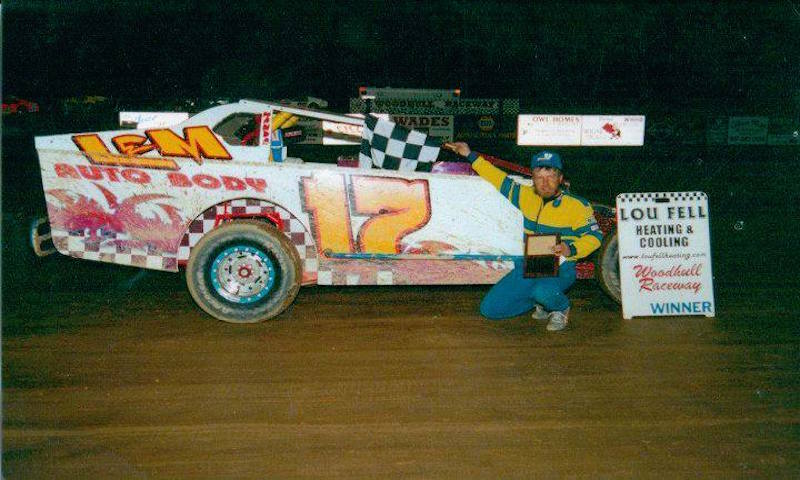 It had been just over 12 years since one of Woodhull’s historic Modified legends lost his life on the third-mile. Sherwood suffered a medical event while in his race car, coming to rest off the backstretch. It was a night that so many shared memories of this past weekend, but the driver known as ‘The Wild Child’ will be remembered for so much more than the night of his passing. Many ‘friends of Woodhull’ shared fond memories of Sherwood last weekend. Here are their stories. 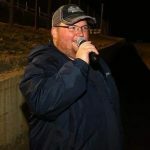 “In my years of helping with the Woodhull Raceway program we came across several ‘letters to the editor’ that were sent in from a man from Michigan named Orin MacIntosh,” explained Colegrove. Colegrove remembered the smile that Sherwood shared in the pit area. The loss and reflecting on memories still stings 12 years later. “You didn’t want dad to pick out your wheels, but when Lyle was a Junior in High School that is exactly what happened,” Sherwood said with a laugh. Sherwood himself had not been back to Woodhull, since Lyle’s passing, until the 2016 running of his brother’s race. Now in 2017, Sherwood has joined Woodhull’s officiating crew and has enjoyed every minute of it being back. Woodhull is a special place to some, but for Sherwood, that carries a much different meaning. 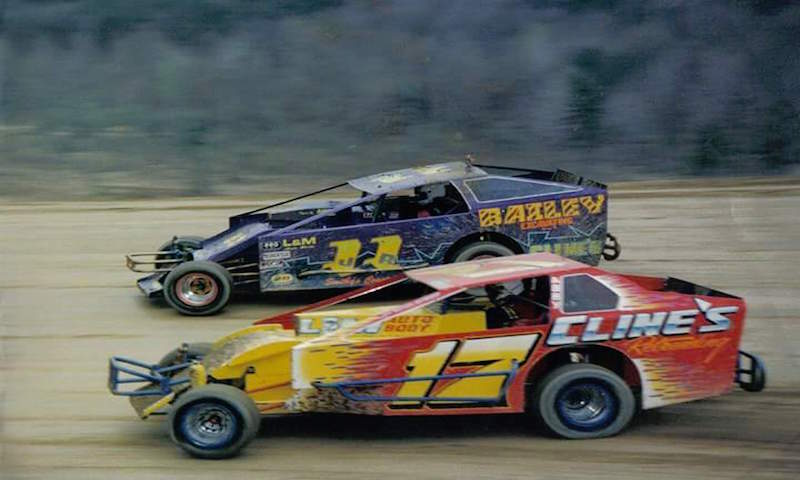 Lyle Sherwood (17) races brother Bobby (11) off turn two at Woodhull Raceway. (Scott Lyon photo). Eventual winner and now multi-time champion of the Lyle Sherwood Memorial, Billy Van Pelt, spoke of one of his fondest memories of No. 17. “Lyle stopped up to the shop one night and wanted to talk about the cars and had some setup questions we discussed,” said Van Pelt. In Victory Lane last weekend, Van Pelt offered up his thoughts on the storied rivalry between he and Sherwood. “My dad raced for the Sherwood’s for years- my dad was really close with Lyle,” said Lawson. Lawson remembers Lyle and his team always running a tight ship. “We used to park next to Lyle at the track,” commented second generation driver Kenny Peoples Jr. The biggest victory in Peoples’ career, the very first Jake Davis Memorial King of the Ring, was won on a hammer-down, bold move using the outside lane. Peoples surely had two racers riding with him that night. Woodhull’s Facebook account posted last week asking for fan submission stories of their favorite Sherwood memory. The most common response, to nobody’s surprise, were of two things- that smile and driving around the outside lane, often one-handed. Sherwood made the “Sherwood lane” famous at Woodhull. Riding around the outside of the race track, often dipping two, and sometimes, all four tires over the backstretch banking. Sherwood would make a daring move to re-enter the track before the high-banked third turn and even passed cars this way on occasion. When asked by former race director Jerry Symonds why he drove off the backstretch bank like he did so often, Sherwood always had a smile with his reply.